The Christmas holidays have come and gone and millions of people will have taken extra time off work – not because they necessarily wanted to but because there was nothing for them to do! Over five million people take a fortnight off over Christmas as slow/no business = no point in going to work! One in six workers are thought to have taken advantages of an extended break with three bank holidays attached to weekends in quick succession, causing fewer cars on the roads and less bums on seats on buses and trains as with a marked drop in commuters. However it’s a different story for retailers, with thousands having opened late and supermarkets trading around the clock all in the bid to try and cash in on the last minute Christmas rush. The federation of Small Businesses said that because of the forced shutdown of many businesses, misery was caused for company owners as they lost out on a potential mass of earnings, due to the lengthy break (of more than five million workers) between Christmas and New Year. It is believed it could have cost the economy up to £1 billion a day. The Federation of Small Businesses (FSB), which represents over 200,000 small businesses, have reported an increase in the number of firms being forced to close last week because of the way the Bank Holidays fall, not only that but many won’t be starting work again until January 6th 2014. The Chartered Institute of Personnel and Development estimated that more than half of Britain’s 10 million office workers could have been given enforced leave last week. In most cases, staff were being told to take part of their annual holiday entitlement over the festive period. It may be the season of good will, but Christmas cheer can become seasonal stress as the costs mount up. British adults estimatedly spent £487 this Christmas, with being perfect hosts and making sure the children have a wonderful time as key considerations, so make sure you are saving throughout the year in order to be able to comfortably afford Christmas and all that goes with it! 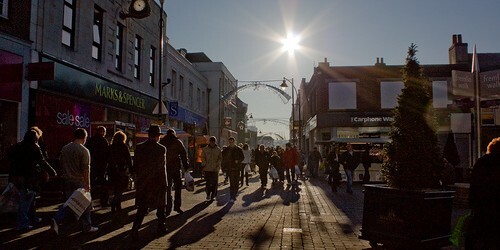 Since this year’s autumn statement by the Chancellor, it has been announced that the high street has been handed £1.1bn after unveiling a string of measures to ease the burden of business rates. After a mass of lobbying from other high ranking business leaders, George Osborne has declared that he has cut the scheduled increase in business rates for next April from 3.2pc to 2pc! What does this mean to small businesses like yours? You can sit back and enjoy a 50pc discount on rate for the next 18 months, whilst rates relief for small services/businesses are going to be extended for at least another year. Christmas 2014 will come around again before you know it, so the sooner businesses plan for it the better; undoutedly many staff will start booking leave before you’re even finished catching up from this Christmas! Consumer spending is at its peak but competition is fierce, both online and on the high street. Make sure you have enough staff to cover the busy period (there is nothing worse than finding no shop assistants when you can’t find something!) Retail giant Argos announced that over the period they recruited at least 10,000 more seasonal workers in order to cope with the large strain, Amazon have also said that they employed more than 15,000 new staff and Royal Mail has declared they brought in over 20,000 temporary employees for the festive time – so train up the new staff in plenty of time, and make sure you have the telephone answering manned and your service is ready to go at full steam. If you aren’t on the positive end in retail then you will be suffering with sluggish growth, poor profits and staff shortages. You need to plan and prepare early, be realistic about how much money you are going to lose or make, we can’t stop the festive season coming round just as quickly as it was over but we can prepare our businesses for the economic downfall that will inevitably happen. Karen owns 2 businesses so is well aware of the need to be contactable, even outside of business hours. She prioritises time spent with family by using 1st Response when she’s not working, so that she doesn’t get distracted from what’s really important.